Field Marshal Montgomery’s battle plan for Normandy, following the D-day landings on June 6, 1944, resulted in one of the most controversial campaigns of the Second World War. Carlo D’Este’s acclaimed book gives the fullest possible account of the conception and execution of Montgomery’s plan, with all its problems and complexities. It brings to light information from diaries, papers, and letters that were not available in Montgomery’s lifetime and draws on interviews with senior officers who were involved in the campaign and have refrained from speaking out until now. Carlo D’Este retired from the US Army in 1978 with the rank of lieutenant colonel to write full time. Among his books are Bitter Victory; Warlord: A Life of Churchill at War, 1874–1945; Patton: A Genius for War; World War II in the Mediterranean, 1942–1945; and Eisenhower: Allied Supreme Commander. ©1983 1994, 2004 by Carlo D’Este (P)2012 Blackstone Audio, Inc. I found the book repetitive, biased (not only did Monty falsely claim that Normandy evolved to his plan, but all British generals and soldiers were nigh worthless) and with major extrapolations (one soldier failed... All British soldiers failed type extrapolations). Very little mention of the US forces. Bradley and Patton would be proud. What did you love best about Decision in Normandy? Typically I avoid listening to history books as I'm listening on the drive to an from work and there are so many map references it's hard to follow along. Since this book was of a narrow focus there were few places to look up. If you're a history buff you won't even need to do that much. Great meta-narrative of a tough campaign. 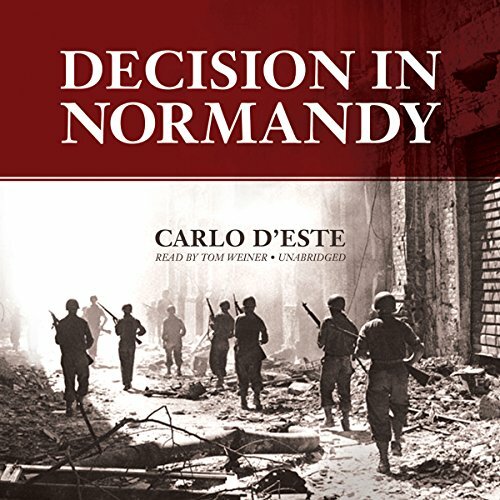 Would you consider the audio edition of Decision in Normandy to be better than the print version? What other book might you compare Decision in Normandy to and why? The description of the interplay between Montgomery and his subordinates in the battle for Caen. D'Este achieves what few have - an impartial and reasoned view of Montgomery. Given all the controversy around the man, this was refreshing. Also, Tom Weiner's performance was exceptional. Would you try another book written by Carlo D'Este or narrated by Tom Weiner? What other book might you compare Decision in Normandy to, and why? I dunno about compare to, but it's a good companion to say a Max Hastings or similar book about the Normandy campaign, as it covers the high-level military decisions and interactions, which a lot of the other books don't. Frequently impossible to tell where narration ends and quoting someone starts. Reading was deathly dull, with very little light and shade, and very poor at pausing for section and chapter breaks. Quite spoiled what would have been an excellent book. The recording that made me appreciate the art of narrating an audio book. Sadly for all the wrong reasons.